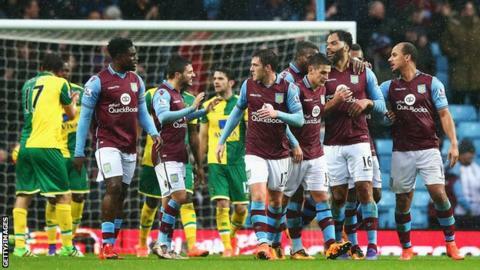 Aston Villa moved to within eight points of Premier League safety with their third win of the season as Norwich slipped into the bottom three. Joleon Lescott's headed goal at the end of a dire first half was Villa's first attempt on target. Gabriel Agbonlahor doubled the lead after the break, stroking home after Declan Rudd misjudged Jordan Veretout's through ball. Norwich, for whom this was a fifth defeat in a row, are now 18th. Newcastle's 1-0 home victory over West Brom saw them leapfrog Alex Neil's side, who haven't won since 2 January. So are Villa staying up? With 13 matches left to play, the distance between Villa and safety is eight points. The Premier League's bottom club face an almost impossible task to haul themselves out of the relegation zone, but who knows what could happen with a bit of confidence? That was in short supply in the first half. Lescott's downward header from Carles Gil's free-kick went in via two deflections - a scruffy goal typical of a poor opening 45 minutes. After Agbonlahor's second there was much greater fluency though, and few of the nerves you might expect of a side with just two wins from 24 games. Norwich made three attacking substitutions as the game wore on, but Villa defended soundly and could have added a third had Leandro Bacuna not blazed wildly over. Two weeks ago in the early kick-off, Norwich saw a 3-1 lead over Liverpool transformed into a 5-4 loss when seeking a much-needed win following defeats by Stoke and Bournemouth. The Canaries were resoundingly beaten by Tottenham in midweek, and now find themselves in serious trouble despite a positive start to the campaign. Their defending was their undoing at Villa Park. The shape of the back line and Rudd's decision to come off his line for Agbonlahor's second goal was particularly poor, but nor did they offer much of an attacking threat. Sebastien Bassong saw a downward header bounce over the bar, Dieumerci Mbokani's tame efforts were easy to deal with, and Steven Naismith was bright without creating too much danger. Patrick Bamford - who came on for his Norwich debut - was denied by Jores Okore's brilliant saving challenge, but had the Chelsea loanee turned in with just minutes to play it surely would only have been a consolation. Aston Villa manager Remi Garde: "Football is strange. Today we didn't play as well as in some games that we lost. Our football is improving, not only today but for a while now, but we haven't been getting what we deserve. "We are still a way away from where we would like to be but we still believe. The way the players fought on the field today means a lot to me. "Everyone was very committed, and behaving in that way we still have a chance." Norwich manager Alex Neil: "Goals change games. The first was poor defending from us, and before that we had opportunities to score but didn't take them. "We didn't defend our box from a set piece, and we gifted the second goal away - it was a basic decision at the back. We huffed and puffed but ultimately didn't do enough to get ourselves back in the game. "This is a test of character. The rest of the season will show whether we have enough character in the group." Agbonlahor has now scored in 11 successive Premier League seasons for Villa. Remi Garde's side scored their first first-half goal in the Premier League since December versus Southampton, also scored by Lescott. Norwich are the only Premier League side yet to keep a clean sheet on the road this season. Villa have won two of their three league home games in 2016 so far - they won three of 19 throughout the whole of 2015. Norwich have won just one of their last 12 Premier League away games (W1 D2 L9). Aston Villa host Liverpool in a 16:00 GMT kick-off in the Premier League next Sunday, while Norwich are at home to West Ham next Saturday. Attempt blocked. Patrick Bamford (Norwich City) right footed shot from very close range is blocked. Attempt blocked. Nathan Redmond (Norwich City) left footed shot from outside the box is blocked. Assisted by Patrick Bamford. Corner, Norwich City. Conceded by Ciaran Clark. Substitution, Aston Villa. Ciaran Clark replaces Micah Richards. Corner, Norwich City. Conceded by Idrissa Gueye. Attempt blocked. Dieumerci Mbokani (Norwich City) left footed shot from the left side of the six yard box is blocked. Attempt missed. Dieumerci Mbokani (Norwich City) right footed shot from the centre of the box is close, but misses to the right. Assisted by Matthew Jarvis. Corner, Norwich City. Conceded by Jores Okore. Attempt saved. Dieumerci Mbokani (Norwich City) header from the centre of the box is saved in the centre of the goal. Assisted by Jonny Howson with a cross. Corner, Norwich City. Conceded by Carles Gil. Attempt blocked. Dieumerci Mbokani (Norwich City) header from the centre of the box is blocked. Assisted by Robbie Brady with a cross. Attempt blocked. Russell Martin (Norwich City) header from the right side of the six yard box is blocked. Assisted by Robbie Brady with a cross. Substitution, Norwich City. Matthew Jarvis replaces Steven Naismith. Timm Klose (Norwich City) is shown the yellow card. Attempt missed. Leandro Bacuna (Aston Villa) right footed shot from the right side of the box is too high. Assisted by Jordan Veretout. Corner, Norwich City. Conceded by Jordan Veretout. Robbie Brady (Norwich City) wins a free kick on the left wing. Attempt missed. Gary O'Neil (Norwich City) right footed shot from the centre of the box is close, but misses to the left. Assisted by Steven Naismith following a fast break. Attempt blocked. Gabriel Agbonlahor (Aston Villa) left footed shot from the centre of the box is blocked. Assisted by Idrissa Gueye. Corner, Aston Villa. Conceded by Timm Klose.